Today we’re going to begin to look back at what was one of the most fun toy convention experiences I’ve had. 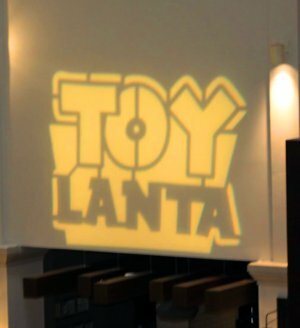 ToyLanta 2019 was a blast from beginning to end, although I have to admit that I didn’t quite make it to the end. Your PopCulteer and his wife had a rare chance to take The Walking Dead studio backlot tour, and skipped out early on Sunday, the last day of the show. Unfortunately, when we booked our tour, we didn’t know that all the GI Joe panels would be moved to Sunday, so I’m hoping that folks recorded them and will post those panels to YouTube so that we can bring them to you here in the coming days. For us, ToyLanta began Wednesday evening. Yours truly spent about an hour hanging out in the lobby of the Marriott Century Center with Ralph (who’s last name I have not managed to learn in the years that I’ve known him) and two online friends I was meeting in person for the first time, Randall Wall and Sean Huxter. Randall creates these amazing cut-out and glue kits of 1/6 scale diorama pieces, notably for GI Joe’s Adventure Team, and Sean, with whom I’ve been online friends with for over twenty years, is a pioneer of 3-D printing for action figure accessories and vehicles. 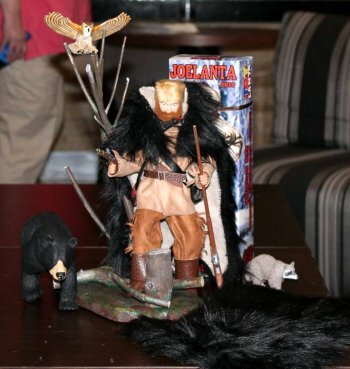 You can find work by both of these guys for sale at Cotswold Collectibles. The great thing about hanging out was that we were just talking about cool toys, and not working or anything. That’s actually the great thing about ToyLanta in general. Once a year I get to go hang out with friends from all over the world who like the same cool toys that I do, and it’s just a quality social time. 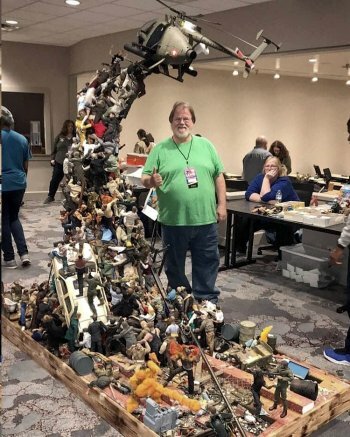 In the diorama room (which you will see much more of on Sunday here in PopCult) I got to talk with Mike Gardner (he did the World War Z diorama seen with him at left that included more than 600 figures) and my old friend, Dave “Tanker” Matteson. Thursday moring, as I mentioned yesterday, we picked up Jack Hall at the airport, and took him to Senoia for our “pre-backlot” visit, and then returned to the hotel before heading out to Hawg & Ale. That’s the restaurant co-owned by Buddy Finethy, one of the founders of ToyLanta, and the guy who twisted my arm to get me to attend my first “JoeLanta” back in 2013. Buddy was the art director of Mellow Mushroom for a couple of decades, and defined the look of that restaurant chain, and this new venture looks to be off to an impressive start. Most of the early arrivals at Toylanta dined there, and it was also open mic night, so your PopCulteer was reduced to reading lips while enjoying the food. Our dinner partner and ride to the restaurant was Andy “Doc” McGrady, and it was a real; treat to hang out with him. Later Andy would be responsible for helping with the film festival, and I have to thank him again for not only picking up the tab for dinner (we’ll get you next time) but for offering his A/V expertise later on. After we got back we were able to pick up our Commander’s package figures and spent time in the diorama room, staring at Mike’s diorama and hanging out with more friends. Friday morning we slept in until noon. On a weekend like this you have to learn to pace yourself. 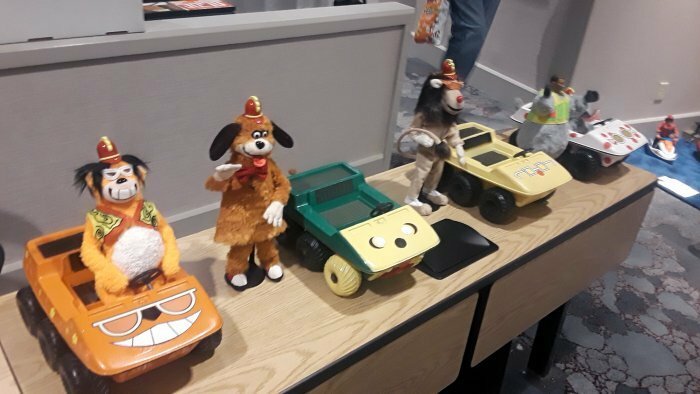 Jack Hall’s Banana Splits figures won first place in the custom figure contest, while the Banana Buggies came in second for best custom vehicle. Later on Friday we shot some video, saw more friends, got into the early preview of the dealer’s room and had a blast at EJ’s Lobby Swap. This year, I was frantically searching for two missing cameras when I should have been gathering up cool stuff to trade, so I wound up just bringing some weird odds and ends, some of which wound up being given away. One of these years I’m going to remember to take some of my good stuff down to Atlanta for the lobby swap. I also picked up my diorama set, designed by Bryan Tatum, to go along with the Commander’s Package figure. You can see the whole set-up at right, in a photo swiped from Scott Norris (thanks in advance, Scott!). After the Lobby Swap we had the State of the Hobby panel, with Buddy Finethy, Greg Brown from Cotswold Collectibles and Sean and Randall, and the consensus, as it has been for the last few years, is that we collectors are on our own, since Hasbro doesn’t seem interested in creating any new high-quality 1/6 scale action figures. The good news is that, we’re in control now, and we’re making cooler stuff than Hasbro ever could. Saturday was a whirlwind, with the general public rushing to the show in record numbers, terrific panels and even some live music during the day. After hours we had the parachute drop and then the film festival. The film festival was curated by Tim and Lisa Weedn, who sadly could not attend due to a last-minute schedule conflict. I was entrusted with a copy of the film festival and with the substantial help of Andy McGrady, we managed to pull it off with just one glitch. After the film festival a record-breaking ToyLanta auction happened, and then Radio Cult and friends treated everyone to another epic jam session concert. I pulled an all-nighter editing that video and getting it posted online, and Sunday morning I was pretty much zombified, but I did manage to see a few more friends and make a few more purchases (including a vintage Action Boy, which has been on my “want list” for fifty-two years) before we hit the road back to Senoia. I’ll tell you about the Walking Dead backlot tour next week, and over the weekend I’ll post photo essays of the goodies I got at the show, plus an extended video of the dioramas, along with photos, on Sunday. This was a remarkable weekend of friends and fun and toys, and I can’t wait until next year’s show. In a week or three, expect a much longer video wrap-up of this year’s ToyLanta. For now, I’m still in recovery mode. Keep checking PopCult for fresh content every day. Those Banana Splits customs are outstanding! De Nada Rudy, glad I could help. Just wish I was taking pictures during the Parachute drop, was too busy running back and forth from the lobby to the 15th floor. Aww, man, I was SO hoping those Banana Splits were coming to market! Tra la la, tra la la lahhh! Sadly, no, but Jack got the heads from some plush figures (maybe Ty Beanie Babies) and had Kathy Ellis make the rest of the costumes.